Wobble Bobble Ball is rated 1.1 out of 5 by 47. Get ready to watch your baby wobble and waddle and crawl on the way to catch the Wobble Bobble Ball! 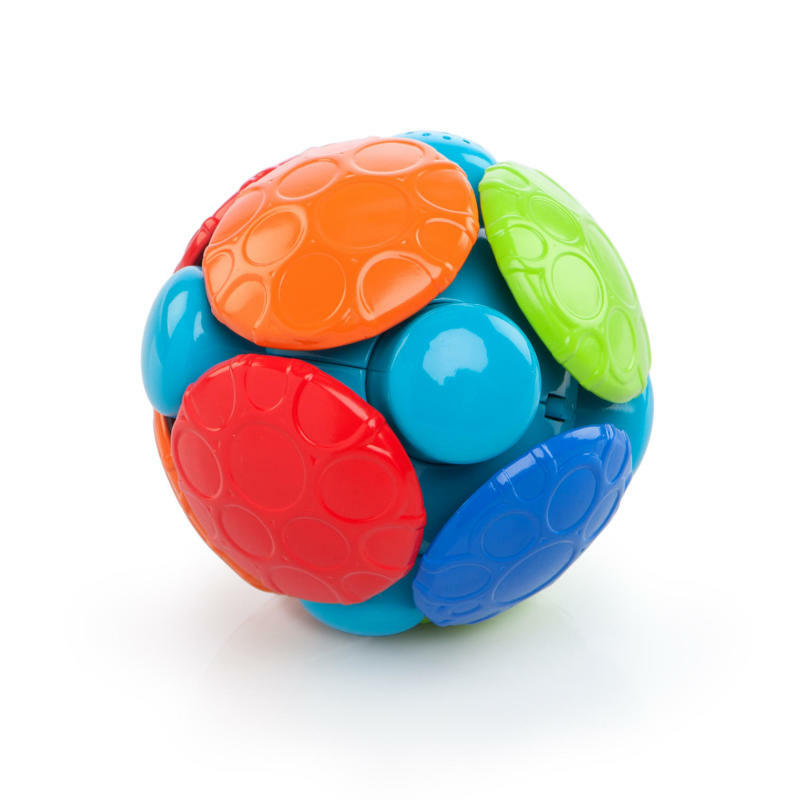 With just a shake, this little ball will roll around the house in different directions. This toy is made with unique textures for baby to hold on tight. When the ball’s on a roll, every u-turn will send baby into a fit of giggles. Let the good times roll for you and baby! Have a wobbly-bobbly ball with baby! Dimension (in) 5.1" x 5.1" x 5.1"
Rated 1 out of 5 by Nonnaof2 from The biggest waste of money !!!!! If I could post this without giving a star rating I would because it doesnt even deserve 1 star. It works until you pull the tab out that lets it run in demo mode. After that it will not work. No matter how many new batteries you put in it .........IT WILL NOT WORK. Do not waste your money on this Oball .....it is junk! Also the screw that holds the battery door on is inset at an angle and hard to get screwdriver to line up with screw head. Rated 1 out of 5 by Kaitlyn527 from Stopped working by time we got home. I just purchased the wobble bobble. By time I reached home it stopped working. We tried to change the batteries and still nothing. So disappointed. Worst toy ever. Rated 1 out of 5 by Crys121017 from Doesn’t work! First time we used it, worked great and my 6 month old loved it. Used a second time and it wouldn’t shut off. Just keeps bouncing, on and off switch wouldn’t work. Tried changing batteries and now it won’t turn on. Too expensive to work one time! Rated 1 out of 5 by Crys121017 from Doesn't work! First time we used it, worked great and my 6 month old loved it. Used a second time and it wouldn't shut off. Just keeps bouncing, on and off switch wouldn't work. Tried changing batteries and now it won't turn on. Too expensive to work one time! Rated 1 out of 5 by Protea from Dud Wobble Bobble I bought 2 balls as gifts for my expecting nephew and niece. When they did not work while in the box, we opened them. Both of them are not working, even after changing the batteries. A total disappointment! Thank goodness I checked them out before handing them over as gifts!